I'm on a plane heading back to the US in the morning (which is to Oregonians 2am), and I'm beyond tired. Just to make sure I put a final period on things, let me revise briefly my comment yesterday about the German influence. 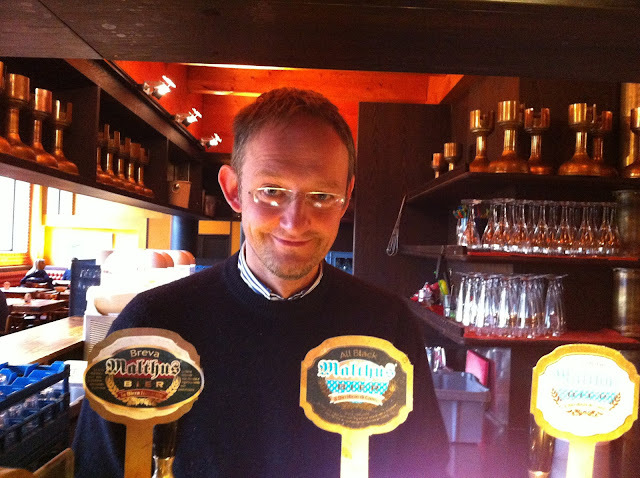 One of the most prominent breweries is Italiano, an old veteran and the main proponent of the German school. There and at other places, like Birrificio do Como which I visited today, they make real lagers in the German mode--decoction, proper lagering (at Como they do 4-8 weeks). There are differences. 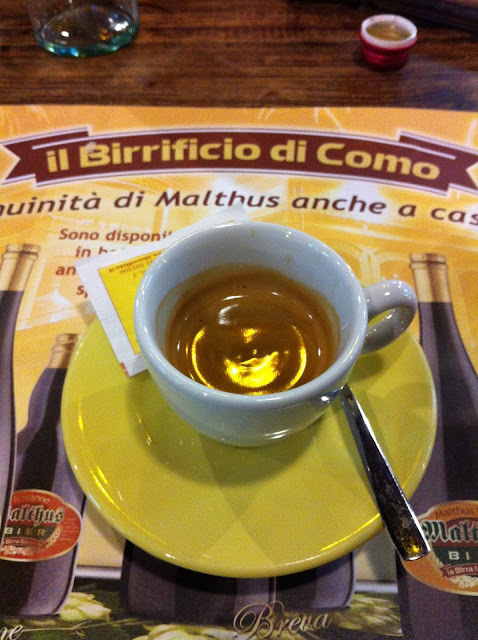 Both Como and Lambrate (influenced by Italiano) make fruitier lagers, fermenting around 54 degrees. In Germany, it's almost as if they're allergic to esters (except in weizens, where the stoke them). I think Italians are used to strong flavors--I have been offered (and accepted!) about 46,000 cups of espresso--and so they don't strip their beers down, they adorn them. Di Como is actually a brewpub, and the biggest in Italy. The talented brewer, Andrea Bravi, has an impressive kit to work with--including a sizable bank of tanks to age his lager. And for me, the stop was absolutely critical to try at least one chestnut beer. If Italians have anything solely theirs, it's chestnut beers. The species is in the same family as oak, and the nut, more starchy than oily, is similar to an acorn. There is no style of chestnut beer, and the brewers all treat them differently. Bravi uses them in the mash. Once they've been roasted over a beech fire, they're ground into flour. It's dense stuff and gums up mashes, so he sticks with 20% and augments with chestnut honey. They contribute two things: a slight roasted-nut flavor (shocker, that), but also a silky viscosity, a bit like oats but gummier. 2. 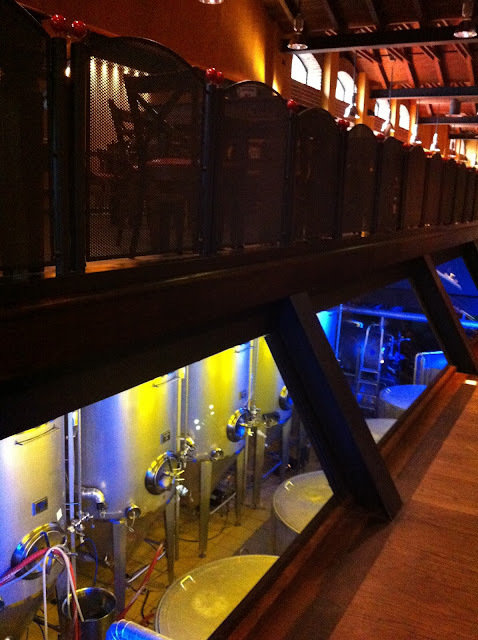 A view into fermentation from the pub. 3. 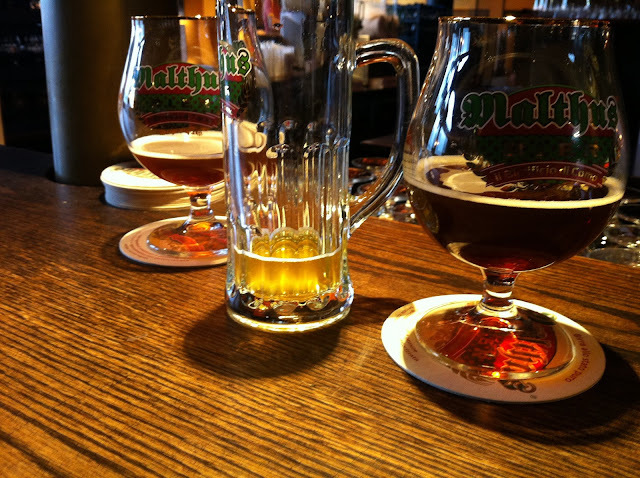 Malthus is the name of the beer; in this photo, the helles (Marilyn, because it's blond) is flanked by chestnut beers.